Bust out the eggs and bacon. These tender on the inside and crispy on the outside potatoes are perfect for a lazy Sunday morning; the process is super easy, and most importantly, it’s delicious! 1. Dice your potatoes into small cubes. 2. Boil potatoes in a pot, until they are tender. Not mushy. 3. Add 3 tablespoons of oil to the bottom of a heavy skillet. Heat over medium heat. 4. Add drained potatoes and spread them in a single layer. 5. Let sit until bottom of potatoes start to crisp. About 6-7 minutes. Cook well. 6. Start adding seasonings: seasoning salt, paprika, garlic powder, cayenne pepper, and black pepper. Season now and again closer to the end. 7. 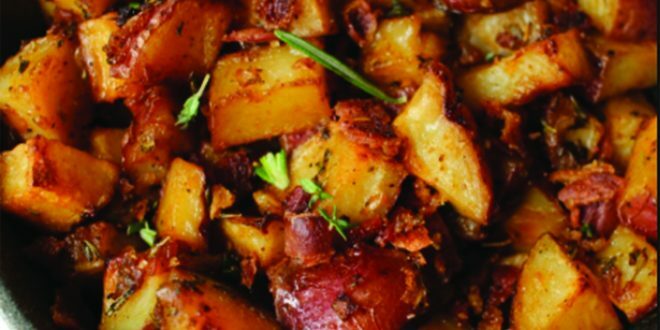 Stir the potatoes and slowly let them crisp up for about 15 min, or until they are the texture you desire. Add seasoning as they begin to crisp. The key to perfect breakfast potatoes is patience! 8. Remove from skillet and enjoy! Once you master the timing of the dish, onions and garlic would be great add-ons.